This badboy was already sold out long ago when I first discovered it. I don’t know what the thing is with the white shroud that makes it so attractive. I mean, it’s basically a SBBN013 but with a shroud that happens to be white, that’s it! Is that so special? OK, it had lume in the first twenty markings in the bezel insert but except for that it's the same watch. The nickname, Beluga or White Dolphin (I've also seen it mentioned as the Storm Trooper), might have been an equally large factor as the white shroud to boost the hype. It sure gives it an extra touch of being rare. 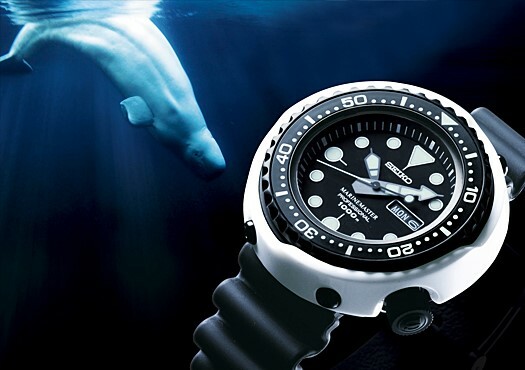 But actually it is quite rare since only 300 pieces were made and with Seiko measures that’s quite few. Anyhow, it is mysterious and has good potential of becoming a legend. I found mine back in June 2014. That it was being located in Germany was a nice surprise since you usually find these gems in either Japan or in the US and rarely within the European Union. It was far from being a bargain but I happily paid and just prayed that it would arrive fast and safe. It sure didn’t disappoint me when I unboxed it. It was just as good as I expected it to be and just like any other Tuna it was big but still wore amazingly well. I loved to wear this watch. It sure didn’t go anywhere unnoticed. #228 - The Seiko SBBN019. Always nice to have a full set! Just like so many times before I lost a lot of money when I tried to sell this watch within Sweden. But the in the spring of 2015, when I was selling a Sinn 856 UTC, I was offered to take it back as a trade which I gladly did and when I later sold it for the second time I managed to recover the lost I made the first time. Take away breakfast from Petite France (my favorite) on an August morning. Being a big fan of the Tuna-series this one qualifies as one of my favorites. It actually was my favorite until I got my hands on the SSBS018 but that's another story.